It’s no secret that I love both pickles and citrus. 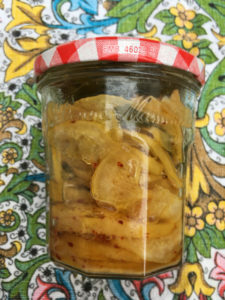 I’ve long combined the two in the Moroccan standby, preserved lemons. After a batch of particularly thick skinned lemons took forever to cure, I stumbled upon Ganga’s ingenious recipe. The beauty of these is when sliced thinly you can eat all of the lemon, unlike traditional preserves where you need to discard the flesh. They’re also easy to make in a small batch. Always use organic or unsprayed home-grown lemons. Conventional lemons may be waxed, stopping the rind from curing. Herbs and spices: I used a pinch of whole black pepper, a couple of fresh bay leaves, a pinch of dried chilli flakes and half a cinnamon quill per jar. You might like: a combination of paprika, kaffir lime leaves, coriander, cloves and/or cardamom. Freeze for 24 hours (I find it usefully to set a reminder on my phone). The next day, place the slices in a colander or strainer to thaw, and drain of excess liquid. In sterilized jars, layer the lemon with your chosen herbs and spices. Cover with good quality olive oil, gently tapping the jar to expel any air bubbles. Cover with a well fitting lid and store in a cool dark place (pantry or fridge). Leave for at least a week before using. Use, finely chopped, as a substitute for traditionally preserved lemons. The oil goes well in salad dressing and on steamed vegetables, or for dunking bread in with dukkah. This recipe is gluten-free, dairy-free, vegan and vegetarian. For more inspiration in the kitchen, check out the recipe archive. For a simple and delicious recipe in your inbox every month, subscribe to Gill’s monthly newsletter. Wonderful! How beautiful they look. You bet me to it. Was just going to tweet you about your lovely recipe. Thanks for sharing.